Home > Health & Wellness > Supplements > CBD Hemp Oil Treatibles Blueberry Chews Large Dogs Over 50 lbs. - 4mg. 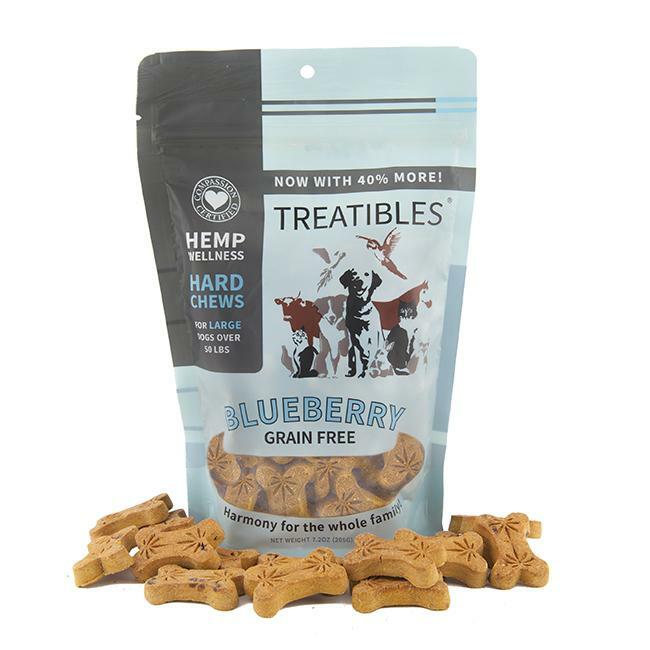 CBD Hemp Oil Treatibles Blueberry Chews Large Dogs Over 50 lbs. - 4mg. Treatibles chews contain non-psychoactive phytocannabinoid rich (PCR) oil extracted from whole plant medicinal grade hemp grown in the USA. Treatibles utilizes a CO2 extraction method to ensure the purest, most effective oil. In addition to several therapeutic phytocannabinoids, terpenes are included creating what is known as the entourage effect, providing a full spectrum of benefits for pets. Cani Bits CBD Oil Dog Treats 10oz. CBD Hemp Oil Treatibles Blueberry Chews Dogs Under 50 lbs. - 1mg. CBD Holistic Hound Hemp & Mushroom Chicken Dog Treats 3mg.